Eight-year-old Arjan suspects his class mate of stealing his special pencil. 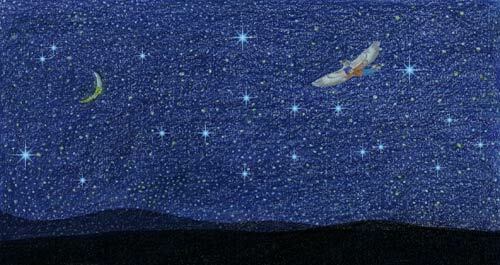 In a magical moment, Guru Gobind Singh ji’s falcon comes alive to help him. Will Arjan get his pencil back? Why does the royal falcon take him back in time to 1705 to witness Guru ji’s court in session? Join Arjan and Khushi, the falcon, in an exciting tale of adventure and friendship. “What better way to create a heroic, problem solving tale? Could I have a Khushi? 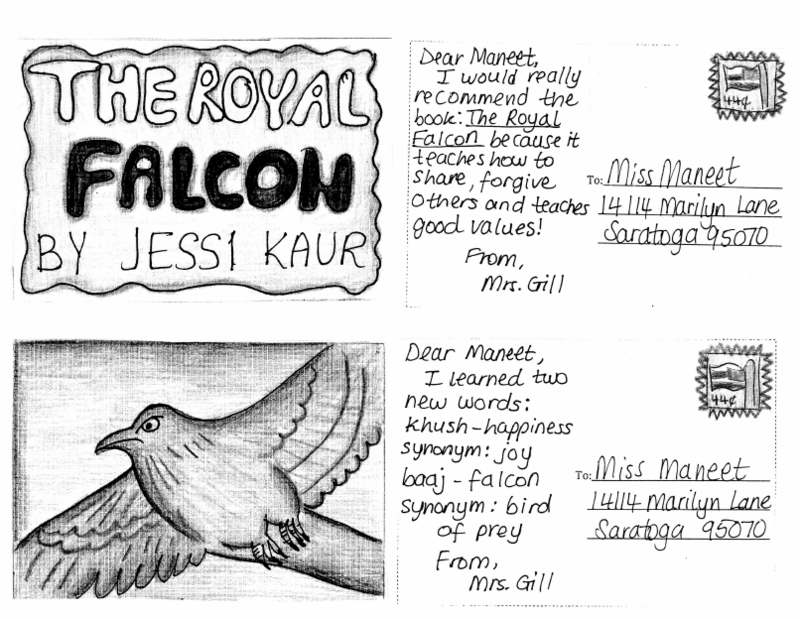 From the modern day school room setting to the ancient court of the Guru, your imagination will soar when you fly with Guru Gobind Singh's falcon Khushi, in Jessi Kaur's The Royal Falcon. Be prepared to confront the directives of your own inner avenues as you journey with Khushi to navigate the Sikh boy, Ajran's, subconscious while he struggles to do the right thing in the wrong situation. Experience the triumph when his choices inspire others and ultimately earn him the reward of recognition where it counts most. Read this book and you may find yourself with a lump of longing in your throat at the story's conclusion. Invites and promotes discussion of Sikh values. Applies historical lessons to modern day living. Reinforces positive Sikh identity and instills values essential to Sikhism. Colorful and lively illustrations animate glossy pages. A two page historical glossary is included. Visually distinctive Sikh identity is predominantly male oriented. Page width may pose a challenge for some readers. I found The Royal Falcon by Jessi Kaur to be a fantasy made real by every day events. Arjan, young Sikh boy, has a magical adventure with an imaginary falcon which helps him sort out troubled feelings of anger and resentment. When something Arjan values is stolen, he becomes upset. Guru Gobind Singh's falcon flies out of the painting the boy is looking at and offers to help him recover his property. 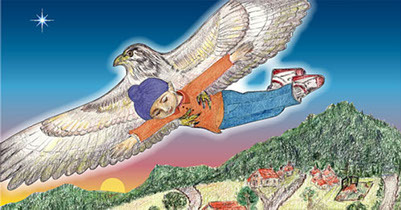 Arjan names the falcon Khushi and together they embark on a series of adventures flying over the school yard, through the city where Arjan lives, and back through time to Guru Gobind Singh's court. His interaction with the imaginary falcon encourages Arjan to grapple with tough questions of ethics, apply what he learns to his situation, and arrive at a positive resolution to his dilemma. The choices Arjan make bond him with his Guru. It brings him closer to the values he has been raised with in a tangible manner, all the while taking the reader along on a journey of self discovery. Read this book and you may find yourself asking a few questions, taking a closer look at your own life, observing how you interact with others, reviewing your personal environment, and hoping to achieve the comfort Arjan finds when he opts for kindness rather than revenge. Author, Jessi Kaur, the mother of one, is a resident of the San Francisco Bay Area, and the co-founder of International Institute of Gurmat Studies headquartered in Tustin, California. She has been a speaker at Gurmat youth camps and multi-faith conventions around the world. Formerly a lecturer in English Literature at Delhi University of New Delhi, India, Jessi Kaur has consulted for the Department Human Resources in high tech Silicon Valley and is the Vice Chairperson for the Fine Arts Commission of Cupertino Ca. Jessi's experience with the younger set becomes obvious in this delightful imaginary tale. Her talent's depth is revealed in the introspection it provokes. Illustrator Pammy Kapoor, the mother of two, and a resident of San Jose California, is a student of advanced art. She captures the imagination with her drawings using a medium which at first glance appears to be color crayon, pencil or pastel, but much the way the tale blends the real and imaginary, seems to combine her technique with computer graphics. The very nature of the illustrations brings them to life making them believable and appealing, perhaps even inspirational to aspiring young artists, and awakens a sense of adventure in the eye of all. Editor Harsharan Kaur of Ellicot City, Maryland, the mother of two, with a B.A and in Literature and an M.A in communication, uses her experience to foster cross cultural understanding and promote peaceful resolution to battle discrimination and bullying in schools. Together these three women make a strong inspirational statement for what can be achieved by motivated mothers bringing together elements of high adventure and thought provoking ethics in their joint presentation, The Royal Falcon. Pammy Kapoor debuts as a children’s book illustrator in The Royal Falcon. She has been engaged with art from an early age. After winning several awards in high school, she pursued advanced art classes in San Jose. Her landscapes and portraits show an eye for detail that is fresh and rare. Pammy has devoted several years of her life to philanthropic endeavors, and has lent her artistic talent to charitable events around the Bay Area. A competitive badminton player until her college years, Pammy continues to enjoy an active life style with golf and walkathons. She is well known for her gourmet cooking. Pammy lives in San Jose with her husband and two children, Jessica and Jason. Harsharan Kaur is a freelance writer and editor. She obtained her B.A. in English Literature from St. Stephen’s College, New Delhi, a Post- Graduate Diploma in Journalism from the Indian Institute of Mass Communication, New Delhi, and an M.A. in Communication from the University of Massachusetts, Amherst. She has taught creative writing at the university level. Her writing and editing has appeared in news magazines and legal journals. She has designed curriculum for youth leadership retreats. Her presentations to Maryland school educators have focused on curriculum-based initiatives to combat discrimination and bullying in schools. Sikh heritage music is her special interest, and she helps organize an annual Gurmat Sangeet competition in Maryland. Harsharan lives in Ellicott City, Maryland, with her husband, Gurinder, and her two children, Nihal and Harleen. The story is based on a historical episode in Indian history. The book is a good classroom read especially when fostering relationships between students to build knowledge, awareness, and acceptance of diverse cultures. It also provides an opportunity to educate and instill good values in students. The protagonist is a Sikh boy who is part of a tradition about which very little is known. It is a wonderful story about compassion in action. It also addresses the issue of class difference and students coming from different socio-economic strata. Furthermore, it is a rich study in complex emotions, and challenging dilemmas that young children face and relate to in their different environments. Classroom activities can give students opportunities to reflect on certain scenarios in the book. 1. Which part of the book can you relate to if something similar happened to you or someone you know? 2. Write about the different ways kindness and compassion was shown in the book. 3. If you could talk to the main character, what three questions would you ask and why? 4. 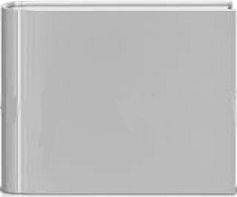 If you could bring something to share for the class, what would it be? Why would you choose this item? 5. Illustrate a picture from the story that shows good values. 6. In your group prepare a skit for the class that shows an incident that is similar to what the characters experienced in the book but occurs in your school. 7. 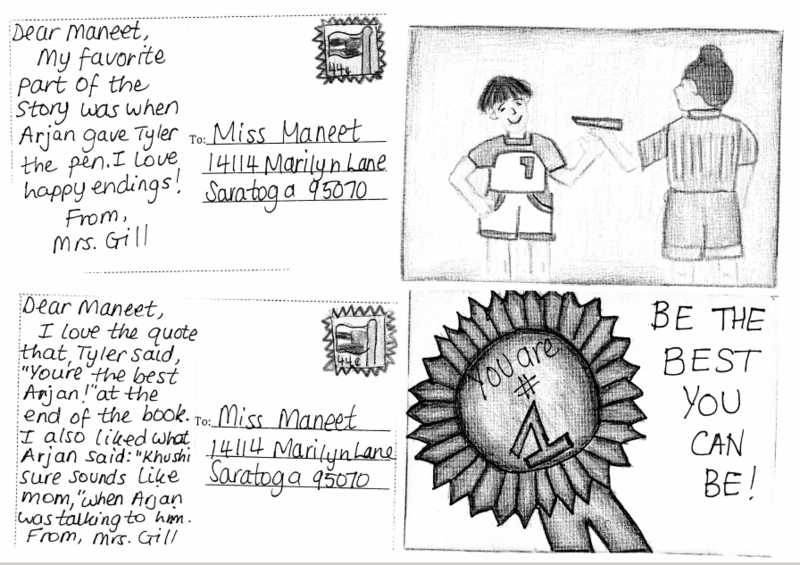 Create a giant postcard on which you summarize the story in letter form. 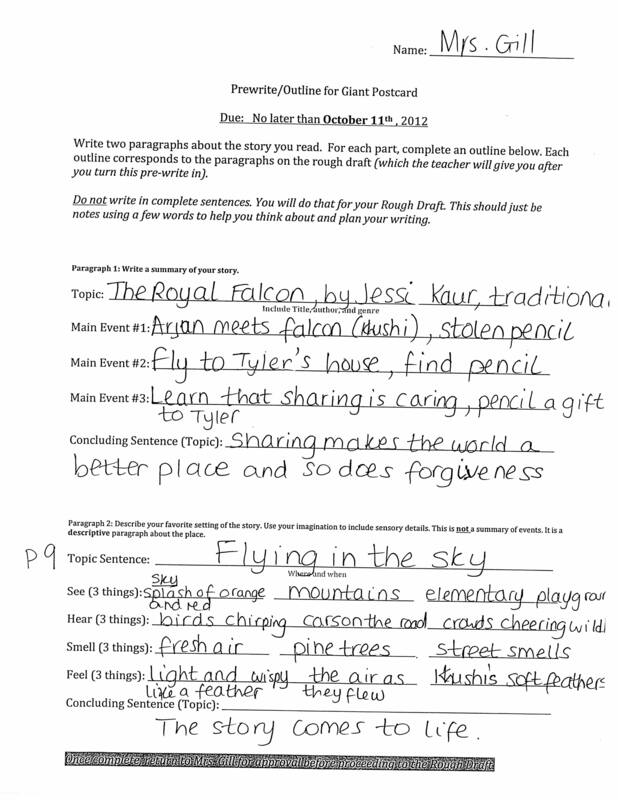 Describe three main events and write a conclusion stating what you have learned from the story. 8. On the back of the postcard draw a picture of your favorite setting in the book. Try to capture sensory details that appealed to you the most. Writing a formal letter will promote awareness and also establish a purpose and message of the book. Please see a sample of the book report and the postcard. For the English Language Arts Class, the questions have been designed to address critical analysis and literary response to the theme, plot, setting, and characters. Encourage students to write descriptions that use sensory details to present impressions of people, places, or experiences. In the Social Studies Class room the teacher may use the questions to instill good citizenship, and encourage students to value the importance of compassion and sharing. Both these values are strongly emphasized in the book and questions and activities are designed to help young students process these messages at a personal level. Arjan is sad and angry because one of his precious pencils was stolen. Have you ever had something special taken away from you? How did you feel? What did you do about it? If you haven’t had anything stolen, how would you feel if something special was taken away from you? To distract himself, Arjan starts talking to the falcon in the photograph and the falcon “comes alive.” Do you think the falcon really came alive or was it his imagination? Describe a time when you have let your imagination run free. What did you imagine? 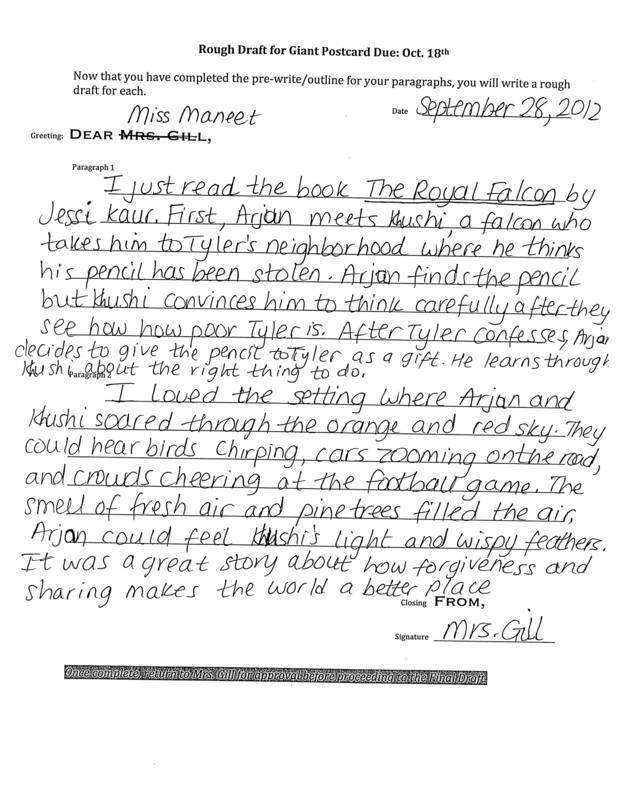 Khushi the falcon offered to grant Arjan a wish. If you could wish for anything, what would it be? The falcon wrapped his talons around Arjan’s waist and they flew away. If you could fly anywhere, where would you go? Why? When Arjan visits Tyler’s room, he is shocked. This is not what he expected to see and certainly not what his own room looks like. The paint is peeling off the walls, the carpet is threadbare, and there are no fancy things in the room. Have you ever seen anyone that appears poor to you? How did that make you feel? Similarly, have you ever met someone that you thought had so much more than you? How did that make you feel? Arjan and Khushi fly back to a scene in 1705, where a fierce battle is taking place. A wicked king has taken away the rights of the people to worship according to their culture and tradition. Does your family have a special tradition? Describe it. How would you feel if someone took away your freedom to practice your tradition? What do you think Guruji meant by that? Describe an event when your anger has been changed by compassion. Contrast it with a time when you did not feel compassion. Which feeling makes you feel better -anger or compassion, and why? When Arjan describes his visit to Guruji’s court, his little sister wants to go also. Do you have a little brother or sister who wants to do everything you do? Does that annoy or please you? How do you handle the situation? Describe a time when you were not able to sleep because you had something on your mind. What was the situation that kept you awake? How did you solve your problem? Do you like to share? Why is it important to share? What are some of the things you have taken to school to share with the class? Describe a time when you have not wanted to share something. How do you feel at that time if someone makes you share? Describe another situation when you have been open to sharing. Tell about the two different situations and how you felt about them. Why do you think Arjan gives the pencil and the eraser to Tyler? Does Tyler deserve it? Would you be able to forgive someone who had stolen something from you? Who do you think was happier – Arjan or Tyler after Arjan gave Tyler the pencil? Why did Khushi take Arjan back to Guru Ji’s court? Why does Guru ji embrace him? Do you like being hugged? Give reasons for your answer. If you were to write a sequel to The Royal Falcon, predict what will happen next. What were some important values that you learned from the story? If you were in The Royal Falcon play which character would you like to be? Why? Bindi Gill has been teaching for the past 12 years at Marshall Lane Elementary School in Saratoga. Frances Nance holds a Master’s degree in Cross-Cultural Education. The Royal Falcon to as many teachers, libraries and friends as you can!